SSC CGL Tier III Admit Card 2017 Released – Check SSC CGL Tier III Exam Date - Download SSC CGL Tier III Hall Ticket 2016-17. SSC CGL 2016 Tier III will be organized on 19th March 2017. The latest news is that SSC has released online admit card for CGL Tier III Exam 2016 on 06th March 2017 for Northern Eastern Region (NER). Those candidates who have been qualified in Tier I and Tier II and are waiting for their SSC CGL Tier III Admit card 2017; they can download it from direct link given here. Staff Selection Commission had scheduled Tier 1 exam on 09th & 16th August 2015. The commission has declared the result of SSC Tier 1 exam . About 1, 67, 073 candidates has qualified in Tier 1 exam and has scored more than cut off marks in their category. These candidates are called for SSC CGL Tier 2 Exam. The exam will be conducted in the month of October 2015. across the country. The SSC CGL Tier 2 exam dates has been announced now. The latest news is that SSC CGL Tier 2 Admit card may be uploaded around 10th - 12th October 2015 for all regions i.e. ER, NER, CR, NWR, WR, KKR, NR and MPR. SscExamTricks.com has notified you as it had announced by the commission. This webpage will cover latest updates of SSC Tier 2 admit card for all regions and exam date for exam. The exam date has been announced now. SSC CGL Tier 2 will be conducted on 25th October 2015 & 26th October 2015. The paper 1 & paper 2 has scheduled on 25th October 2015 and paper 3 has planned to be held on 26th October 2015. The official notices regarding the exam dates and admit card dates has been uploaded by the commission. Those candidates who has qualified in SSC CGL Tier 1 exam result 2015, they can download their Tier 2 admit card from direct link given below. for those candidates who had qualified in SSC CGL Tier 1 Exam 2014. In case any qualified candidate who do not receive the Admission ticket for the CGL Tier 2 Examination at least 7 days before the commencement of the said examination or are unable to download from respective regional office website should immediately contact the respective Regional Office of the Staff Selection Commission. Candidates will have to login their account to get admit cards call letter for the written examination. Admit card is mandatory card to get entry into the examination hall of written test. No candidates will be allowed to enter/ appear in the written examination without admit card. Admit card contains information about date, time and venue of examination along with instructions for written examination on it. 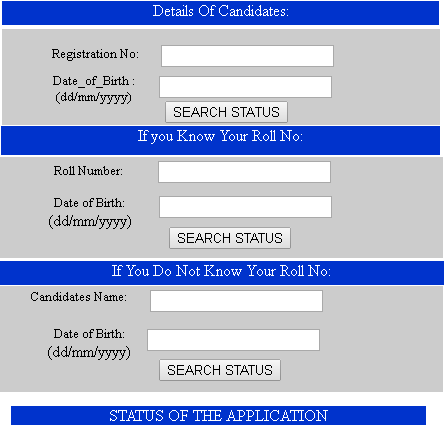 Admit card will be valid with original identification of the candidate. Candidates are required to produce the original identitity such Voter Card ID, PAN Card ID along with admit card to the duty officer before the commencement of the examination. Earlier SSC had released result of Combined Graduate Level Tier 1 Exam 2014 which was conducted on 19th, 26th October, and 16th November, 2014 at various centers all over the country at various centers in all over the country. Re-examination at some centers was held on 18th January, 2015 at Jaipur. A total of 1301391 candidates appeared in this examination. On the basis of CGL (Tier 1) Exam - 2014, number of candidates provisionally qualifying for different papers of Tier-II are as for Paper-I and II only 1,42,642 (Total candidates) and Paper-III additionally 77,577 (Number of Candidates who have opted for Statistical Investigator/Compiler or have left the Post Preference ‘Blank’). Those candidates who had qualified in SSC CGL Tier 1 Exam 2014 and waiting for admit cards for SSC CGL Tier 2 can find the direct link and check their result/ scorecard/ cut off marks from the direct link provided in the end of the posts. Earlier Staff Selection Commission (SSC) was scheduled Combined Graduate Level written exam Tier 2 on 24th and 25th January 2015 for the various posts in the various government department of SSC. But SSC CGL Tier 1 Exam 2014 Result was got late due to exam cancellation of several centres and reexamination conducted on these centres. SSC had released result of Combined Graduate Level Tier 1 Exam 2014 which was conducted on 19th, 26th October, and 16th November, 2014 at various centers all over the country at various centers in all over the country. Re-examination at some centers was held on 18th January, 2015 at Jaipur. The Result of SSC Tier 1 Exam 2014 was declared on 05th March 2015. The qualified candidates are called for SSC CGL Tier 2 Exam 2015. The SSC CGL TIER 2 Exam will be conducted on 11th and 12th April 2015 (New / Revise date after declaration of Tier 1 Result). The SSC CGL TIER 2 EXAM 2015 will be conducted by Pen MODE. In Pen Mode, the exam was entertained through filling of circles on Computer Generated Page called OMR Sheet containing information of answers which was selected by filling circle in it. The OMR sheet will be filled by Blue/Black ball point pen. No rough blank sheet will be issued for calculations/rough work in exam. The Exam will be available in bilingual languages- English & Hindi. The exam was conducted an objective multiple choice question paper of 150 questions of 200 marks to be done within 2 hours or 120 minutes. The exam was consisted of three papers contains questions of English language and comprehension and Math / Quantitative Ability. Note: The date of admit card mentioned above is just expected based on the analysis of previous admit cards released by SSC. There is no official information is provided by SSC. The final date of admit cards will be purely decided by SSC. No query will be entertained in this regard. 5. Note down Room No., Floor and Seat no. of the back side of the Admit Card page. · Click on Official Website. · Go to the Admit Card links provided at the corner. · Enter Registration number and Date of birth. · Save or Print the admit Card for SSC CGL Tier 3 Exam.